RICHMOND, Calif., Dec. 04, 2018 (GLOBE NEWSWIRE) -- Ekso Bionics Holdings, Inc. (NASDAQ: EKSO), an industry leader in exoskeleton technology for medical and industry use, today announced that the worldwide adoption of the EksoGT™ exoskeleton has allowed stroke and spinal cord injury patients to take 100 million steps to date (click to tweet). More than 240 leading rehabilitation centers in over 30 countries helped their patients walk 50,000 miles in the EksoGT exoskeleton— the distance of walking around the world twice. “Our Barrow neuro robotics program works to combine customized robotics with trained functional therapy to maximize outcomes for neurological patients. The EksoGT is a significant piece in our neuro robotics program and allows our team to further customize rehabilitation care,” said Chris St. Clair, Senior Director of Rehabilitation Services at Dignity Health in Arizona. Learn more about innovative centers that are leading the way in exoskeleton rehabilitation by visiting Ekso Bionics’ Centers of Excellence. EksoGT™ is the first exoskeleton cleared by the FDA for use with stroke and spinal cord injuries from L5 to C7. In Europe, the CE-Mark cleared EksoGTTM allows us to work with patients impacted by all neurological conditions and lower limb weakness. 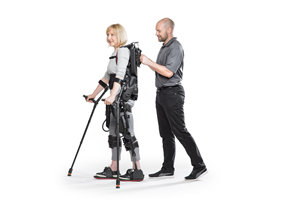 The EksoGT™ with SmartAssist™ software is the only exoskeleton available for rehabilitation institutions that can provide adaptive amounts of power to either side of a patient’s body, challenging the patient as they progress through their continuum of care. The suit’s patented technology provides the ability to mobilize patients earlier, more frequently, and with a greater number of high intensity steps. To date, this device has helped patients take 100 million steps in over 240 rehabilitation institutions around the world. Any statements contained in this press release that do not describe historical facts may constitute forward-looking statements. Forward-looking statements may include, without limitation, statements regarding (i) the plans and objectives of management for future operations, including plans or objectives relating to the design, development and commercialization of human exoskeletons, (ii) estimates or projection of financial results, financial condition, capital expenditures, capital structure or other financial items, (iii) the Company's future financial performance and (iv) the assumptions underlying or relating to any statement described in points (i), (ii) or (iii) above. Such forward-looking statements are not meant to predict or guarantee actual results, performance, events or circumstances and may not be realized because they are based upon the Company's current projections, plans, objectives, beliefs, expectations, estimates and assumptions and are subject to a number of risks and uncertainties and other influences, many of which the Company has no control over. Actual results and the timing of certain events and circumstances may differ materially from those described by the forward-looking statements as a result of these risks and uncertainties. Factors that may influence or contribute to the inaccuracy of the forward-looking statements or cause actual results to differ materially from expected or desired results may include, without limitation, changes resulting from the Company’s finalization of its financial statements for and as of the period and year ended December 31, 2017, information or new changes in facts or circumstances that may occur prior to the filing of the Company’s Annual Report on Form 10-K that are required to be included therein, the Company's inability to obtain adequate financing to fund the Company's operations and necessary to develop or enhance our technology, the significant length of time and resources associated with the development of the Company's products, the Company's failure to achieve broad market acceptance of the Company's products, the failure of our sales and marketing organization or partners to market our products effectively, adverse results in future clinical studies of the Company's medical device products, the failure to obtain or maintain patent protection for the Company's technology, failure to obtain or maintain regulatory approval to market the Company's medical devices, lack of product diversification, existing or increased competition, and the Company's failure to implement the Company's business plans or strategies. These and other factors are identified and described in more detail in the Company's filings with the SEC. 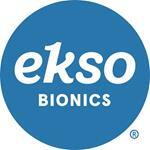 To learn more about Ekso Bionics please visit us at www.eksobionics.com. The Company does not undertake to update these forward-looking statements.